The second session of the Energy Sector Working Group (WG) was held on Wednesday 27 May in Vrbas Municipality, municipality specifically selected as a good example of energy efficiency. The session focused on development of good practices in the area of energy efficiency on local level, but also on activities of the Ministry of Mining and Energy in EU negotiation process as well as EE projects implemented by the Government. Deputy Mayor of Vrbas Municipality opened the session, welcoming participants to pioneer municipality in improving EE in public buildings. Municipality Energy Manager, Mr. Nikola Vujanovic presented activities within the municipality from the initial establishment of the EE office until today. He stressed that there were some hesitations on creating such an office and that the initial steps in introducing EE in municipality were done by personal efforts of few enthusiasts. Official first step was the adoption of the municipal Development Strategy for 2010-2015 where for the first time EE was included in the official municipal document with clearly set goals. It is important to stress that from 30 decisions set in the Strategy, so far only one was not implemented until today. The major milestone was creation of the EE Office within the municipality that included information system for energy management, introduction of energy audit for all public buildings, as well as preparation of local energy plan that was latter adopted unanimously by municipal assembly. The EE Office has started issuing energy passports for buildings so all buildings in the jurisdiction of municipality have one. The EE Office has its website as well as info point in the municipal building and consultations with citizens. 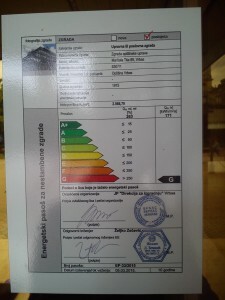 First energy passport that was “issued” to the city administration building. Mrs. Dragana Jovic from the Ministry of mining and energy has presented activities of Ministry in negotiation process i.e. during the explanatory and bilateral screening. She has also presented Ministries’ plans in EE, and stressed that set goals from the I Action plan (2010-2012) were not fulfilled. She stated that trainings for energy managers through Serbia would start from September. Mr. Ljubisa Antonijevic from Ministry of Education, Science and Technological Development presented project of improving EE in schools a project by the KfW, a project that will be implemented in two phases. Debated that followed focused on issues of financing improving EE in not only publicly owned buildings but also private ones. Other issues included interest of local governments in monitoring energy consumption on local level, possible energy savings and sharing knowledge between municipalities.